Drinking Out Loud: What‘s The Future Of Online Radio Post Radar? For many, Radar Radio was an epicentre of engagement and a catalyst for creativity. The state-of-the-art station, located in the heart of East London’s hipster district, provided a platform for those who may otherwise be plying their trade from the comfort of their bedroom. Radar had resources en masse: studios equipped with the latest tech, free DJ workshops, and the chance to network with big name brands such as Smirnoff (who were working in collaboration with the station). Not all that glistens is gold, however. Radar Radio was founded and funded by Ollie Ashley – son of Newcastle United & SportsDirect owner Mike Ashley – and the station became somewhat of a passion project for the then 28 year old. Having previously been studio manager at local heavyweight stations NTS Radio and Rinse FM, young Ashley was no stranger to the world of radio as a whole. What they had attempted to create in Radar, though, far surpassed any expectations of a typical radio station. In a way, it ended up doubling up as a youth club. It was a place for young creatives to come and flex their ideas, a supposed safe-haven for all. This utopian notion was rather short lived in hindsight – Radar eventually collapsing under the the weight of reported racism, sexual harassment, and homophobia. Station regulars Pxssy Palace were at the forefront of the inquest, releasing a public statement citing the toxic work environment following their departure. Radar Radio subsequently went off-air on April 16th 2018 and has been inactive ever since. The scale of the operation is only highlighted when you hear that 16 people were left without a job and Ashley was left with debts and fees close to £5million, also begging the question: will there ever be another ‘Radar’? If so, how can we ensure it doesn’t fall victim to moral corruption or any other forms of toxicity within the workplace? Drinking Out Loud has invited Nadine Artois (co-founder of Pxssy Palace) to the discussion, with the DJ being able to provide an insight into where it all went wrong for Radar, the necessary steps to ensure safety for all in future, and the bravery in Pxssy Palace ultimately putting their foot down. 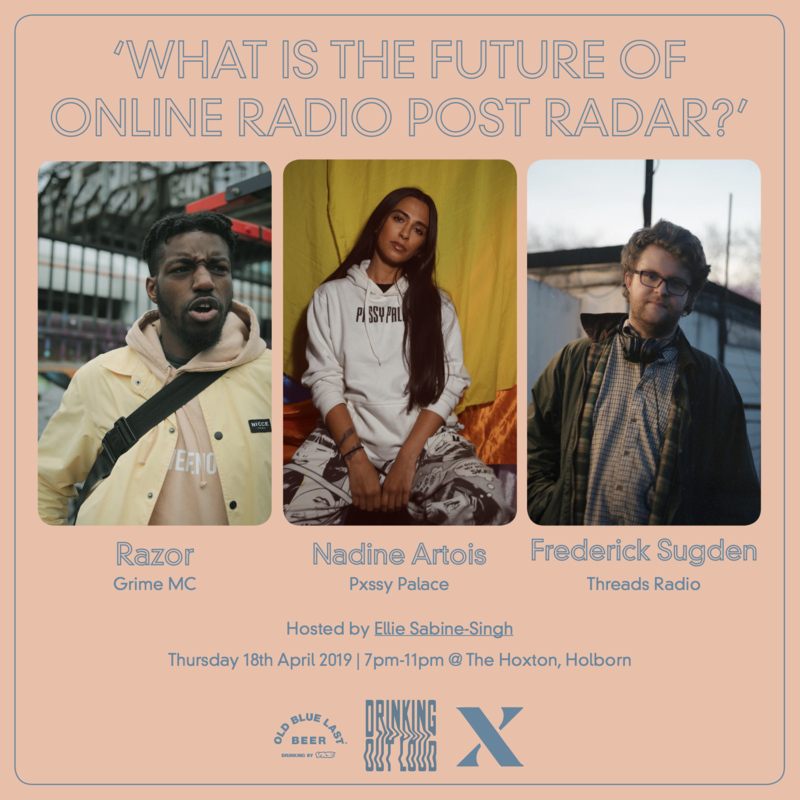 To add further insight as to where the future of online radio lies, Frederick Sugden (Threads Radio/Loose Lips/London Promoter’s Society) will aim to divulge conceivable ideas to benefit the longevity of online radio. The third panellist comes in the form of an artist – East London’s Razor (Southpoint/OverTheEdge) has guested on just about every one of Radar’s would-be competitors – he will be further informing the audience of just what it is that allows Reprezent, Mode FM, Foundation FM and many other youth-led stations to exist and flourish in harmony. Do you have your own ideas as to how the industry can do better? Are situations such as Radar’s closure the result of male-dominated environments? Moreover, what is the future of online radio post Radar? Drinking Out Loud puts a twist on your average panel talk; tackling serious topics whilst maintaining the banter and good vibes which keep us engaged. There’s nothing insular, high brow, or cliquish about Drinking Out Loud, but that’s up to you to discover for yourself. 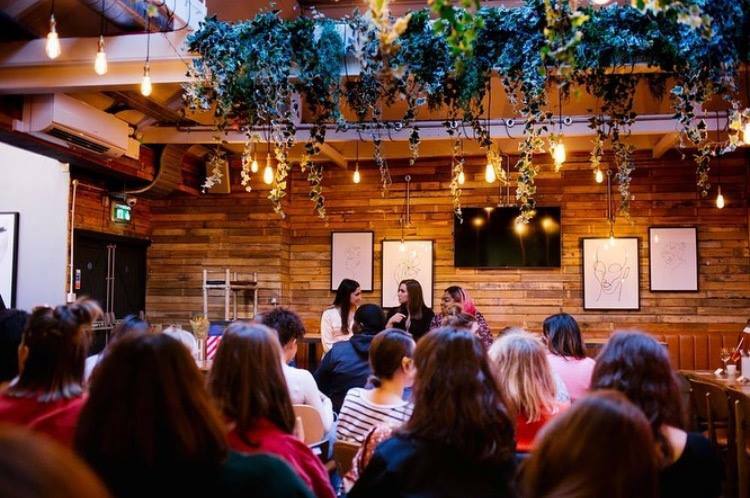 Make sure you head down to The Hoxton, East London, from 7pm on 18th April (next Thursday at time of publishing) for this seventh instalment of Drinking Out Loud. We look forward to seeing you there!